I am a little bit off kilter today. Yesterday I kept getting requests to share a Google Doc that I thought I had removed all links to. I am in the process of moving all my free downloads to Craftsy and I thought I'd amended all the links on the blog to reflect that. Have you heard about Craftsy? It started out as a tutorials website. You can pay for an online course that you will always have access to. There are also forums and organised chats for the course members and the tutor. It seems like a great idea and if I had loads of cash I probably would have signed up for dozens of courses by now. I signed up for the emails for the site, just to keep up with what courses were available as I was really interested in the concept but was waiting for the right course to lure me in. One of these emails told me they were starting to sell patterns and Indie Designers could use their site to sell their patterns free of charge. On top of that, it was any kind of craft pattern! This was the service I'd been waiting for. I sell my knitting patterns on Ravelry and will continue to do so, but Craftsy was the perfect venue for my free tutorials that weren't really knitting patterns. I felt that with the service being free of charge I couldn't really lose and started to move put all my patterns and tutorials on there. I decided to list my knitting patterns as well as it can't hurt to have two different markets to sell in. You can see my patterns here. It is quite a lot of work to upload and enter all your pattern details, so I got my main patterns and tutorials on there and ground to a halt ,due to KAL fever and growing pain. I really shouldn't have stopped with my uploads because yesterday I got a great deal of attention on Craftsy. In particular, my Glasgow Rose Stained Glass Template got a lot of attention. Do you remember that little blast from the past? 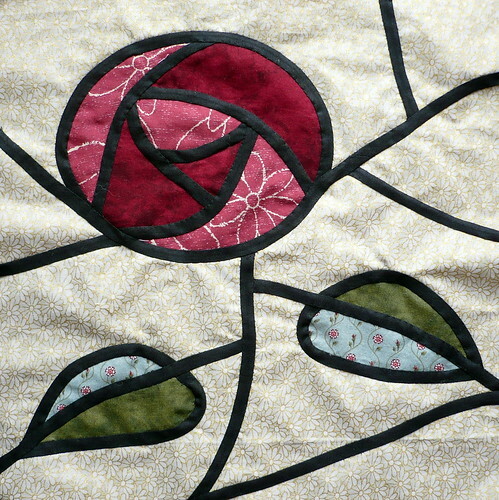 It was a template I designed when I was doing my quilting class in April 2010. This block still isn't sewn into a quilt. To have any kind of interest has surprised me. I have had over 1200 downloads in 24 hours! I couldn't understand where all this interest was coming from until someone tried to access my old Google Docs version of the pattern and couldn't. I emailed them the new link to the Craftsy Pattern Page and asked where she had heard about the pattern. She pointed me to this. It is a newsletter she received from a website she is a member of. If you look at the link you can see my little template in the top left hand corner. The newsletter was promoting free quilting patterns on Craftsy. This newsletter was the reason I had so many downloads of my pattern in the last day or so. I am really flattered, but I wish I'd known it was coming and then I would have ensured there were no links anywhere to the old Google Docs download. I didn't think to update the link in the old post from April 2010, because I assumed no one would be reading it. How foolish was I? I updated the links on the sidebar of the website, and on the Downloads page, but didn't think about the original post. So this has given me a kick up the backside. I am going back to checking all my tutorials and downloads and making sure nothing links to Google Docs anymore, and it all points towards Craftsy where I can see how many people are interested in my patterns. It has been a very interesting couple of days! It's amazing how the Internet can suddenly recycle old patterns and posts and create a storm in a teacup. It reminds me that whatever goes online, stays there, just waiting to be found again!